All Souls Counseling Center was founded in 2000 by community therapists who were concerned when a crisis in accessibility of services occurred following the closing of two mental health facilities that served Western North Carolina’s uninsured and underinsured. These closings limited the population being served to those with severe, persistent, and chronic mental illnesses, or to those who qualified for Medicaid. The vast majority of the uninsured or underinsured — those with problems that can be successfully treated without intensive case management or inpatient hospitalization like depression, anxiety, PTSD, etc. — were left with nowhere to turn. In response, these therapists began providing counseling on a sliding scale fee basis for people with no insurance or who were underinsured at in-kind office space donated by The Cathedral of All Souls. All Souls Counseling Center became an independent 501c3 nonprofit in 2000. Quickly outgrowing the donated space at the Cathedral, All Souls Counseling Center moved to an office at 23 Orange Street near downtown Asheville. As the center continued to grow it moved again, just down the street to 33 Orange Street. 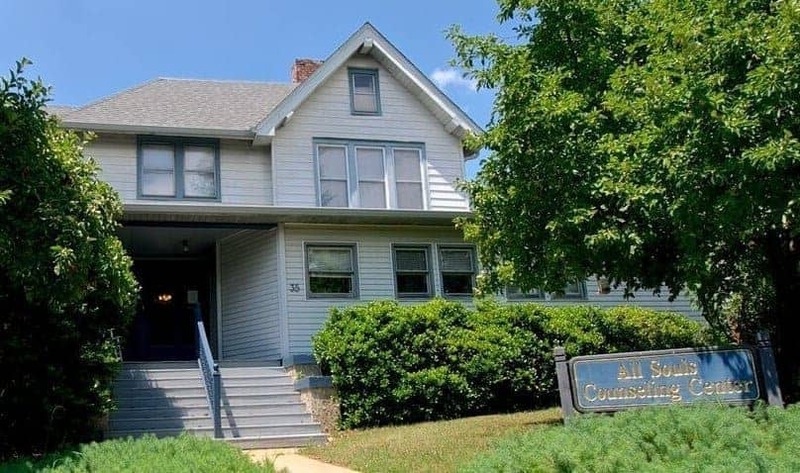 The demand for our services continued to increase and in 2009 ASCC purchased a large historic house at 35 Arlington Street, providing a permanent home where the majority of our counseling services are offered. Today ASCC has grown to include 20+ professionally licensed therapists and a psychiatrist who provide high-quality compassionate mental health counseling for uninsured and underinsured residents of Western North Carolina. We continue to offer counseling on a sliding scale fee basis. We have expanded our services to place therapists within partner community organizations to make counseling as accessible as possible. Unfortunately, there still remains a gap in care for the uninsured and underinsured residents of our region. ASCC’s dedicated therapists, psychiatrist, staff, and board are committed to ensuring that folks in our community who need mental health counseling can receive it and that cost is not a barrier.